You will not believe what I am about to tell you. Minecraft PE 0.12.1 has been submitted to the Apple and Android stores. That doesn't mean you can get it yet, though. It will have to be checked. But. the great news is, it will be out this Tuesday. September 8 and will be awesome! 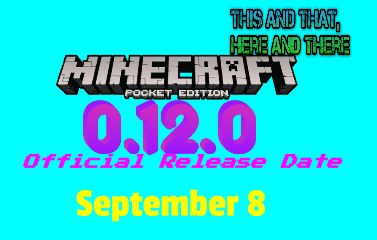 With Nether, Potions and more, I am really looking forward to it! To see all the features in one post, click here. That day will also be my first day of school. With a new Gravity Falls episode and the big Pocket Edition update, Labor Day will be great! To see my post about Gravity Falls: "The Last Mabelcorn" click here.